Los Angeles, CA - Rallysong, the online platform where artists and their supporters rally for world-changing causes announced today that it will partner with Plumb to raise money for Food for the Hungry. With a mission to end world hunger and global poverty, Food for the Hungry is a Christian organization serving the poor in underserved areas around the world since 1971. "I am a huge fan of Rallysong," explains Plumb. "They make it so easy for artists to share their passions for causes, and give fans a chance to come together to make a big difference in the world. Food for the Hungry is working tirelessly to change the patterns of poverty, and I'm honored to use my songs to help support such an incredible organization." The Rallysong process works similar to a crowdfunding platform. Once a campaign has launched you can support the associated cause by donating and sharing with your friends to meet the campaign's fundraising goals. In return, contributors gain access to unreleased music, merchandise and experiences. By pledging a minimum of $2 toward this initiative, Rallysong supporters will receive two brand new songs from Plumb at the conclusion of the campaign. At the $75 rate, contributors will receive a unique copy of Plumb's new book, "NEED YOU NOW: A Story of Hope." Each book offered will have cover artwork created by children living in remote villages in Guatemala. All contributions in between will work to aid specific programs targeting needs in healthcare, education, hygiene and agriculture. 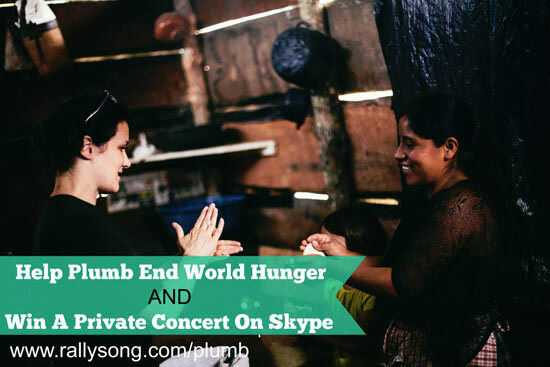 Additionally, every dollar donated will be an entry to win a private concert from Plumb via Skype OR VIP tickets to her upcoming tour. Funds raised from this campaign will benefit Food for the Hungry. The organization has launched a new program unique to two areas of the world that have extreme rates of chronic malnutrition in children under the age of 5: Guatemala and Bolivia. Malnutrition in the first three years of a child's life can cause permanent damage in development, including stunted growth, illness, learning disabilities and even death. By focusing their work on the first 1000 days of a child's life, Food for the Hungry works directly with mothers and community leaders to help reverse the cycles of poverty, creating an environment for positive mental, physical and immune system development. "We could not be more thrilled to partner with Plumb and Rallysong to help the most vulnerable in the world," explains Milam Byers from Food for the Hungry. "This is an example of an artist engaging with fans and really doing something that matters. Together, we are ending poverty." Rallysong will accept donations for this campaign through December 2nd. For further details and to contribute go to http://www.Rallysong.com/Plumb. For more information about Rallysong or to be notified about future campaigns, visit www.rallysong.com. Founded in 1971, Food for the Hungry provides emergency relief and long-term development programs with operations in more than 20 countries to help the world's most vulnerable people. Learn more by visiting www.fh.org. Social connections include www.facebook.com/foodforthehungry and www.twitter.com/food4thehungry.